I had never heard of a Neti pot before last year – I was having terrible problems with my sinuses that just never seemed to end. I actually saw them talking about Neti pots on The Drs. television show and thought it was the grossest thing I’d ever seen. Then I did a little research and found out that TONS of people swear by them, and now I’m one of them! 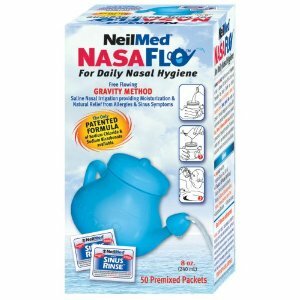 If you have allergies or problems with your sinuses, I highly recommend that you try using a Neti pot if you haven’t already, and now you can get one for free from NeilMed if you’re one of the first 20,000 to sign up as a Facebook fan and fill out a short and simple survey. I requested one for my dad because he has sinus issues also but is resisting getting one of his own, and I’m not about to share mine 😉 Hurry over to Facebook, these will go fast! Thanks to Shannon at The Bargain Buggy!